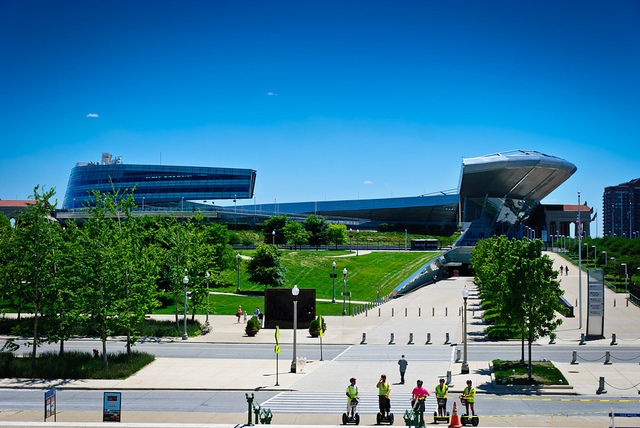 Is expanding Chicago's soldier field a hail mary pass? - Archpaper.com Is expanding Chicago's soldier field a hail mary pass? Chicago Mayor Rahm Emanuel is reportedly considering a plan to boost capacity at Soldier Field, the city’s football stadium, in a bid to host the Super Bowl. But as the Chicago Tribune’s Blair Kamin laid out in a story Sunday, the play is a Hail Mary. Indianapolis’ new Lucas Oil Stadium, designed by HKS’ Bryan Trubey [read AN’s Q+A with Trubey here], hosted the Super Bowl in 2012. Indy has also hosted the NCAA Final Four and the Big Ten football championship. The stadium, which holds 70,000 people under its retractable roof, has spurred nearby development and solidified Indianapolis’ position as a Midwest sports Mecca. The ability to seat 70,000 fans is considered a prerequisite for hosting the Super Bowl, so Soldier Field’s capacity of 61,500 falls short. Soldier Field is currently the smallest stadium in the NFL. But an additional 5,000 would still make the home of the Chicago Bears a tight squeeze for spectators of the country’s biggest sporting event. Architects Benjamin Wood and Carlos Zapata modernized 1920s-era Soldier Field in 2003, but the Bears’ desire to add more seating lost out to the city’s imperative to preserve Soldier Field’s historic colonnades. The $690 million renovation lost its National Historic Landmark status anyway in 2006. It’s unclear who’s studying the possible expansion for the Mayor, but whoever reviews the plan may have to lock heads with public scrutiny as intense as the stadium’s design challenges.